Scapholunate dissociation, also called rotatory subluxation of the scaphoid and sometimes also known as the Terry Thomas sign. It involves a disruption of the scapholunate ligament resulting in instability. The scapholunate ligament is U shaped and divided into three compartments. A complete fear of the dorsal part, results in dissociation. The cause is usually trauma, with patients presenting following a fall onto the wrist, or hand. The future complication is degenerative arthritis of the joint. Sometimes patients will not recall any injury. In this particular case, the patient, a 62 yo woman presented with pain in the wrist. She recalled no trauma. There was mild tenderness over the wrist. The x-ray findings were unexpected. 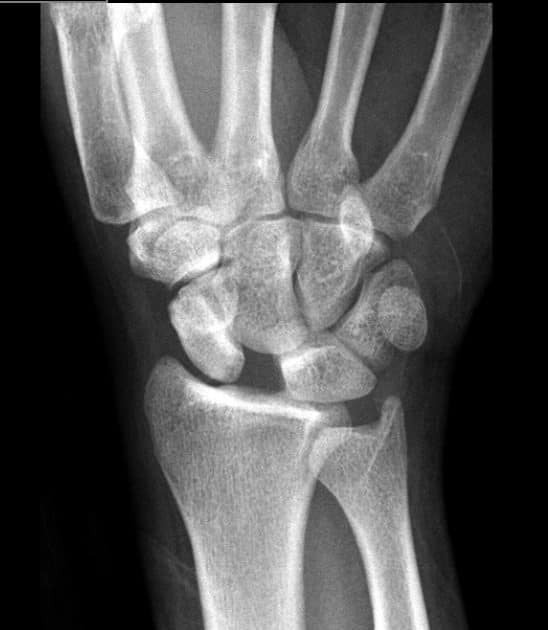 An x-ray of the wrist will demonstrate a widened scapholunate space, usually greater than 4mm. This is best seen on a clenched fist view. This is known as the Terry Thomas Sign reflecting the gap in the teeth that this entertainer had.